Dr. King was invited to be part of the team of experts to provide porcelain veneers to makeover patients on the hit TV show. She put her cosmetic dentistry skills to work by transforming their smiles with veneers to help build their confidence. Dr. King is the only dentist in Georgia to have her work featured on this popular TV series. Fresh breath is something we would all like, but it can be difficult to maintain day in and day out. We have outlined a few practical steps to help you ward off bad breath! When the checklist below is diligently and consistently followed, you can achieve fresh breath! This is one you have probably heard from your dentist many times, but brushing multiple times a day is important because it removes food particles and bacteria from your mouth resulting in fresh breath. You are probably sick of your dentist telling you to floss. But, flossing is truly essential in achieving fresh breath because it removes food particles between teeth, a place where your toothbrush can’t reach. Flossing fights against plaque build-up and also strengthens gums. If food debris and bacteria are not removed, bacteria in your mouth will feed on it, causing bad breath. Did you know that up to 90% of your bad breath comes from your tongue? Kind of gross right? That’s why investing in and using a tongue scraper is vital to fighting bad breath. Scraping your tongue removes a layer of “biofilm” that acts as a protective shelter and energy source for deeper bacteria. Scraping off this layer will go a long way in fighting bad breath! Everyone loves the fresh taste after using a mouthwash, but be aware that it will only conceal bad breath for a short period of time and in some cases, make it worse. Keep in mind, alcohol free mouthwashes may be better for you because it won’t dry-out your mouth afterwards. Make sure you are drinking 6-8 glasses of water daily to stay properly hydrated and avoid dry mouth. Saliva is essential to moisten your mouth and wash away food particles and bacteria, the leading contributor to bad breath. This is the best way to maintain your oral hygiene. Regularly seeing your dentist and hygienist for checkups and cleanings will get you the fresh breath you are looking for! DISCLAIMER: The advice offered in blog posts is for information purposes only and is generic in nature. We are in no way offering a definitive diagnosis or specific treatment recommendations for your particular situation. Any advice offered is no substitute for proper evaluation and care by a qualified dentist. Your Next Teeth Whitening Could Help a Child in Need! Smiles for Life teeth whitening is back at the Atlanta Center for Cosmetic Dentistry! Now through June, 100% of whitening proceeds are donated to Smiles for Life Foundation and Usher’s New Look Foundation. During this promotion we donate our time and Opalescence donates the whitening material. This program offers a great opportunity for patients to give back while brightening their smile. Patients can also use this service as a tax deduction! Smiles for Life, raises money for seriously ill, disabled, and underprivileged children locally and around the world. Since 1998, participants of the Smiles for Life promotion around the world have raised $38 million. This money has benefitted hundreds of children’s charities. The Smiles for Life foundation is operated through the Crown Council, an alliance of leading dentists focused on treating patients, not teeth. Dr. Debra Gray King and Dr. Charlie Cooper have both been members of the Crown Council for many years. They have seen the impact of this program first-hand while serving with the council in the Dominican Republic. Watch the Smiles for Life introduction video below! Usher’s New Look is a non-profit organization that transforms the lives of underserved youth. Through their 10-year comprehensive program they help develop our future global leaders. 100% of New Look participants have graduated high school and have gone on to higher education or job placement. We appreciate the positive impact Usher’s New Look has had on the Atlanta area. We hope the benefits from this promotion will support more youth on their road to a successful future. In the video below Usher’s New Look participants tell about their experience and how the organization has changed their lives. Contact us to schedule your Smiles for Life teeth whitening! Whiten your smile, help a child. As one of a select few number of American Academy of Cosmetic Dentistry (AACD) fellows across the world, Dr. King sees many celebrity clients. A stunning smile isn’t just important for the red carpet; it can make or break a career. One of the fastest ways to a perfect smile is through veneers, though it does take an expert to make them look flawless and natural. Here’s a look at three celebs who have corrected their million-dollar grins through cosmetic dentistry. Take a close look, because one of them made a costly mistake, which we’ll reveal at the end. 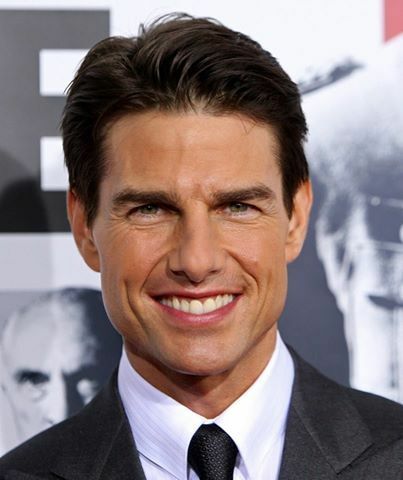 Tom Cruise is a mega-star, there’s no question about that. His teeth, on the other hand, needed quite a bit of help before Tom could take on the polished look he has today. In his earlier movies, it was quite obvious that he was battling with crooked and discolored teeth. Now, they’re dazzling, straight, and bright. Hilary Duff grew up in front of the camera and warmed our hearts as Lizzie McGuire. Truth be told, she did have nice teeth early on, but at some point she allegedly chipped one of her front teeth on a microphone. Ouch! As you can see in the later picture, her teeth now have a more uniform and vibrant appearance, in addition to correcting the chip. Like many people, Keyshia Cole had a gap between her front teeth, called a diastema. She turned to veneers to correct it and the results are stunning. Now, she has a very glamorous smile, full of wider, brighter teeth. So which of these three missed the mark with their cosmetic work? 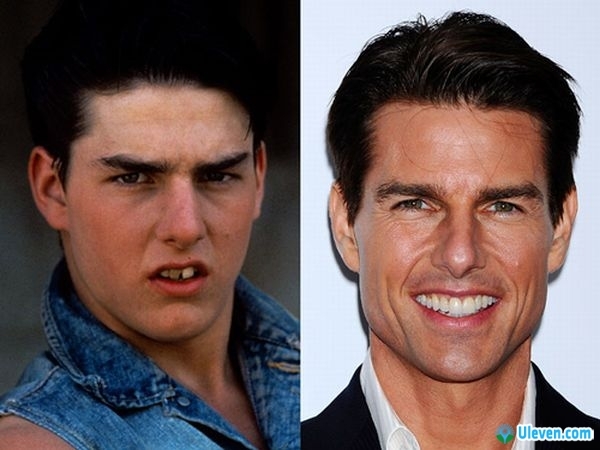 If you look at any photo of Tom Cruise today, you’ll see the natural symmetry of his face was not honored when his cosmetic treatment was performed. Although we never treated him, it looks like his twisted tooth could have benefitted from orthodontics beforehand. Everyone’s face has a line of symmetry down the center, and the front teeth lie on either side of it. With Tom, it’s very easy to see that his front right tooth is too far over to the left to look natural. Veneers are wonderful and can instantly transform a smile. They’re effective whether you have crooked teeth a chipped tooth, gaps, or simply want a bright and uniform smile. However, it’s very important to have them done by an experienced cosmetic dentist, who can help you avoid cosmetic dentistry pitfalls and ensure that your smile is worthy of the red carpet. If you’d like to see how Dr. King can transform your smile, contact us today. Straight teeth are important for a lot of reasons. Studies have shown that people who have beautiful smiles are perceived as being smarter and more successful, plus perfectly-aligned chompers make it easier to maintain your oral health. There is a time and place for traditional braces, but most adults want to avoid them at all costs. They’re bulky, detract from your smile, make it difficult to clean, and are sometimes painful to wear. When they’re necessary, they’re very beneficial, and the positives well outweigh the negatives, but a lot of the time, the same results can be achieved without braces. Invisalign is a great alternative and allows you to correct a crooked smile without having to wear braces. Aside from the obvious advantages of avoiding traditional braces, the aligners don’t affect your appearance. They’re clear, and cannot be detected from a conversational distance. Plus, they can be easily removed for cleaning and eating, making it very easy to maintain your oral health throughout treatment. The system relies on CAD/CAM technology. A digital map of all your teeth is made, and a computer program then designs your ideal smile, deciding precisely where each tooth needs to be and how it must be angled in order to achieve it. After this, it calculates the number of steps, or aligners, that will be required to perfect your smile. The aligners gradually move your teeth and are flexible, so they’re far more comfortable to wear than traditional braces. Invisalign aligners must be worn all day, just like traditional braces would be, though they can be taken out for brief periods as needed. Every two weeks throughout treatment, you’ll switch to a new set of aligners. You’ll meet with the doctor frequently throughout treatment to check your progress, but you’ll receive a couple of sets of aligners each time, which will be switched at the doctor’s recommendation. At first, they’ll feel tight, but as your teeth shift into their final position for each aligner, they’ll fit perfectly. Because the process is streamlined and very precise, treatment can often be completed in less than one year.Not everyone is a candidate for Invisalign, but the majority of people can straighten their teeth without braces by using this method. Our doctors will perform an examination, look at your x-rays, and review your history to determine if the process is right for you. If you are a good candidate, then you can begin the process of having the 3D model of your teeth made. For more information, and to see if you’re eligible for Invisalign, contact us to schedule your new patient visit! Mention this blog and receive a $300 credit toward your Invisalign treatment. At the Atlanta Center for Cosmetic Dentistry, we’re not only dedicated to giving our patients the best possible care, we’re passionate about philanthropy. There are many causes that we routinely donate to and programs that we work with, but the months from March through June are incredibly special here. During this time, we help raise funds for Smiles for Life, a non-profit organization that helps children all over the world. Whiter teeth can enhance your entire smile and brighten a room. Studies have shown that a beautiful smile makes you look more successful, smarter, and can even enhance your dating prospects. Now, a whiter smile can also make you a philanthropist, because when you whiten with us, you’re helping children everywhere improve their lives. One of the partners in the Smiles for Life program is a company called Ultradent, which makes many whitening products under the trade name Opalescence. When you choose to have your Opalescence whitening done in our office now through June, any money (100%!) raised goes straight to charity. Half of it goes to a local charity of the Atlanta Center for Cosmetic Dentistry’s choosing (we’ve chosen Camp Southern Ground! ), and the other half funds a Smiles for Life-approved charity. Their list is extensive, and focuses on organizations that have maximum impact on seriously ill, disabled, and underprivileged children across the globe. Because of people like you, Smiles for Life has raised more than $33 million since 1998. Atlanta Center for Cosmetic Dentistry is very proud to say, that with the help of our patients, we have contributed over $130,000. The whitening you’ll receive is prescription-strength and is only available through a dental office. This is one of the regular treatments we provide for our patients, so you can rest assured you’re getting a top-of-the-line product, our highest standard of care, and are helping kids at the same time. Help us get the word out about this wonderful program. Even if you’re not a candidate for whitening treatments, you can still enrich the lives of children by sharing this information with your friends. Like us on Facebook and share a link, so that everyone hears about this wonderful and unique opportunity. If you’re interested in having your teeth whitened under the Smiles for Life program, we’d love to hear from you! Give us a call or request an appointment to schedule your whitening treatment!